If you've got a large iTunes library—and even if yours isn't of epic scale—you've probably spent a lot of time buying music, ripping CDs, tagging files, and organizing playlists. It's essential that you back up all this content. If your hard disk goes belly up, you'll lose a lot of music and videos, as well as other content. You can re-download some purchased content from the iTunes Store (but not all; see below). You may be able to re-download content purchased from other online music vendors, such as Amazon, or if you purchase directly from label sites. But if you've ripped a thousand CDs, remember how long it took for each one of them? This takes even longer if you rip DVDs or Blu-Rays. If need to rip them again, that would take weeks. So, to make sure you never lose any of this content, you need to back up your iTunes library and other media files regularly. Here's how to do it. To re-download any of this content, go to your Account in the iTunes Store (in the iTunes app), and you'll see the items that are available. Whether or not you can re-download all this content depends on which country you are in, and what types of content are available in that country. However, Apple does not allow you to re-download audiobooks or tones (ringtones and alert tones). So if you have any of those types of content, you must back it up yourself. If you use iTunes Match, you may think that your music is safe, but this may not be the case. There are plenty of problems with truncated track downloaded from the iTunes Store and iTunes Match, and you may not get the same files that you matched. If you've purchased content from other providers, you may or may not be able to re-download it. If you listen to audiobooks, and get them from Audible, and know that you can access your audiobook library at any time. If you buy music from Amazon, you are aware that you can download your music from your Amazon Cloud Drive. Other sites may or may not let you re-download your content. The biggest problem is that you don't know if any music vendor will still be around in the future, or if an artist or record label will pull their content. For this reason, it's best to back up all your digital content. Given the size of movies and TV shows, you might want to skip backing them up, if you bought them from Apple; there's a good chance the company won't go out of business any time soon. And Amazon is unlikely to go bankrupt in the immediate future. But some studios may remove their movies and TV shows from the iTunes Store, in which case you may not be able to get new copies of them. With the above in mind, it's easiest to back up everything. There are several ways you can do this. You could just copy your iTunes Media folder to an external hard drive. However, each time you do this, you copy everything in the folder, overwriting the previous folder. If you have a large library, it can take hours. One easy way to back up your media is to use Apple's Time Machine. This backup feature, built into OS X, only requires that you connect an external hard drive to your Mac. It backs up files automatically, and you don't need to remember to do so. You don't get much latitude about choosing what gets backed up with Time Machine, though. You can exclude folders—such as the Movies folder, in your iTunes Media folder, if you decide to not back up movies—but beyond that, you don't have many options. If you use Time Machine, get the biggest hard drive you can. 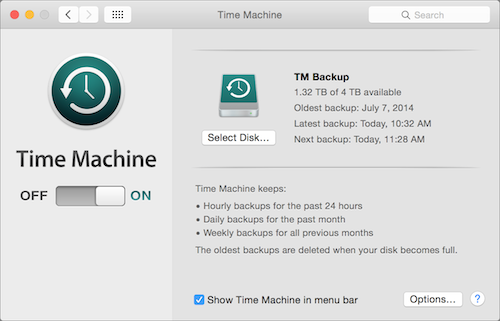 You don't need to keep it connected to your Mac all the time—especially if you use a laptop—and each time you do connect the drive, Time Machine will run a backup. 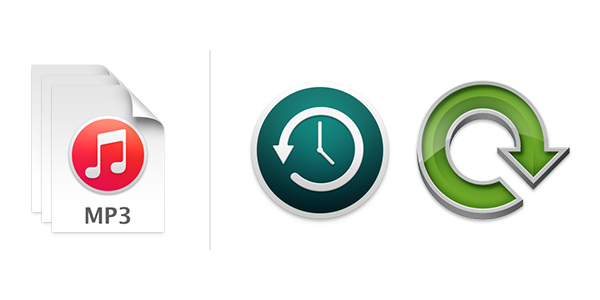 You can also get an Apple Time Capsule. This is an AirPort Extreme base station with a built-in hard drive, which you can use for Time Machine backups. Using this method, the device doesn't need to be connected to your Mac; it all works over Wi-Fi. For more flexibility, you can use Intego Personal Backup. 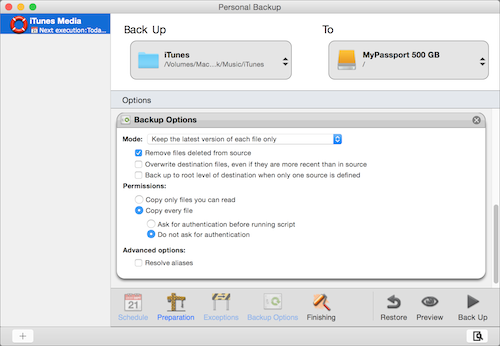 Unlike Time Machine's (more or less) all or nothing approach, Personal Backup lets you choose exactly what you want to back up, exclude specific types of files, and set schedules. 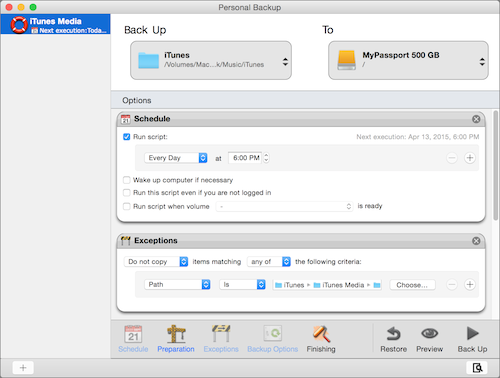 Instead of backing up every hour, as Time Machine does, Personal Backup lets you run backups at specific times or frequencies. One of the most useful features in Personal Backup is the ability to only back up files that are new, or that have been updated. This first time you back up your iTunes Library, it may take a long time, but each subsequent backup will be much quicker (unless you've just bought a few seasons of Game of Thrones or Downton Abbey). Personal Backup scans your source folder and the destination folder, finding which files are different, and only copies them. It also removes any files no longer in the source folder, if you wish, so those rented movies that were backed up last week won't keep taking up space after you've removed them from your iTunes library. So back up your iTunes library and your media files. It is inevitable that you will lose some of them one day, and it's best to have extra copies. This entry was posted in How To and tagged backups, Intego Personal Backup, iTunes, iTunes Library, Media Files, Time Machine. Bookmark the permalink. Well, this is a mac security blog after all.